This is the most common response for Black, when White approaches at , if you look at contemporary pro games. Playing on the third line is territorial, and the variations that follow are mostly to do with Black's initial 4-4 point making territory in the corner. This play has been seen increasingly in the past decade. a, the slide into the corner, is the most common, and emphasises corner territory. b is common if white has the upper right 4-4 point. d is common if white has the upper right 5-3 point nearest this side. b and d are both common in the kobayashi fuseki. 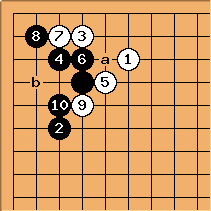 Black sometimes plays tenuki after , considering a and d as miai for living with his stones. If d is not available, the tenuki is dangerous for black. These further plays constitute a standard joseki - perhaps the most common such pattern of all, now. See also 4-4 point low approach low extension, slide, 3-3. 4-4 point low approach low extension, slide, 3-3 tenuki explains about the position in which White omits - this is generally bad - and Black attacks at b. 4-4 point low approach low extension, slide, squeeze discusses black 2 at b, aiming for influence. 4-4 point low approach low extension, slide, outside attachment discusses black 2 at c, a modern, aggressive variation. 4-4 point low approach low extension, 3-2 contact play on the slide discusses 2 at a, which also isn't joseki. 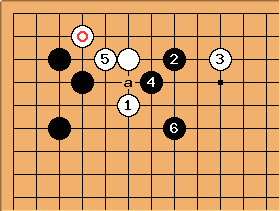 Instead of the slide to 1, White can extend back on the side immediately, or play tenuki here. See 4-4 point low approach low extension, tenuki for detailed analysis. 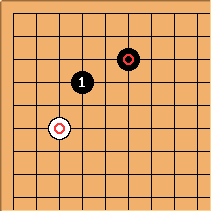 The tenuki play allows Black to attack with the diagonal attachment; evaluations of the severity of the attack seem to have changed in the 1990s, and nowadays White often does play tenuki. It is unusual for White to invade directly at the 3-3 point (see 44 Point, Low Approach, Low Extension, 3-3 invasion ): since Black's corner is not so large, this doesn't have high priority. The major variation occurs when Black blocks on the upper side, allowing White to play at a. Now Black is changing plan, giving up the corner for outside influence. See 4-4 point low approach low extension, slide, pincer for this line. Also 4-4 point staircase joseki for a complex variation. There is also Black 1 here (see 4-4 point low approach low extension, slide, attach), an old idea in the case of the one-point jump, but here really only played often from 1995 onwards. It is an attempt by Black to develop on both sides. It is also a standard manoeuvre for White now to play , perhaps in response to a black move in the direction of the circled point. White will play this way to build up strength or even to settle a group here. 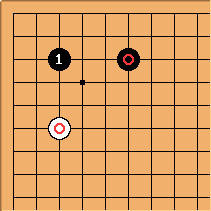 There are some well-known joseki variations: see 4-4 point low approach low extension, contact. DaveSigaty: I was interested in whether the slide is really the most frequent continuation against the small knight. It is the most frequent according to GoGoD CD, appearing about 40% of the time. Having said that, the most frequent strategy for White after the small knight extension is to tenuki with her next move. This is a little more frequent than the immediate slide. 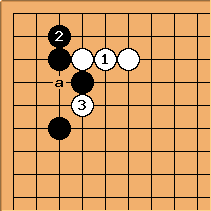 Once White plays tenuki, Black and White are about equally likely to play next in this area. Black has played conservatively with the small knight extension and White's original small knight approach is a resourceful stone so this may not be the most urgent part of the board. A significant portion of the final shapes, including the slide, occur after White or Black come back to this corner. Charles Matthews Yes, I think the swing in opinion about the diagonal attachment attack (not just my prejudice, since Guo Juan talks about this) has led to a substantial use of 'kakari kikashi' by pros in recent years. 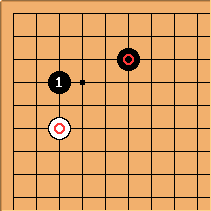 That is, White plays the approach in the first diagram in order to get an answer (rather expecting the keima); and then treats this as a kikashi or probe. Anyway, such seems to have been the fashion. Bill: Historically, I think that the large low extension has been the most common in high level play. In premodern times the low extension was considered too conservative, while the high extension was not territory oriented. 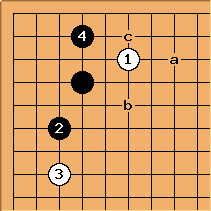 It was GoSeigen who first argued for the low extension. He pointed out that, with the marked stones on the board, this is an even position. Then is a good move. Charles In a sense, don't you need to argue more: that here isn't any more ideal? That anyway would make the Go Seigen reasoning more interesting, in line with some of his other iconoclastic ideas. Making this large low enclosure looks good by classical, territorial standards. Bill: Well, the 3-3 is even more territorial, having fewer weaknesses than the large low enclosure. It does seem a bit low, however. Myself, I do not see a clear preference for any of these plays. 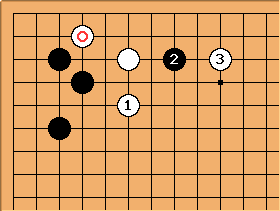 this is also old joseki, if white decides to go elsewhere then black can pincer a, white will respond with b. connecting at c for black does not work well. Sorry if this doesn't belong here, but I was wondering, what is the object of ? Is he treating lightly so that if black invades between he can play shimari on top right? 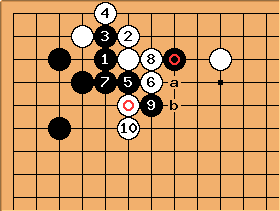 Or, if black kakari's on top right, he can play the kosumi tsuki joseki forcing W into a cramped position? Blake: This is called the mini-chinese. rokirovka: One opponent played against me instead of extending on the top. I had already played at the middle left star point, so I was strong on the left and probably should have just played tenuki here, but I followed the advice to play if White omits the extension along the top. What is the correct reply to ? See Go Bloopers for a discussion of why after is questionable. As you can see, the continuation went badly for me in this corner. After , I admitted defeat in this corner fight and decided to cut my losses, playing elsewhere. My marked stone and are horribly weak (the ladder after Black at a, White at b, was bad for me), and White has a strong position on the top and good influence toward the center. So, be careful with the advice about attacking with a pincer at the marked stone if White omits the extension along the top. If White plays a different useful move such as his marked stone here instead of the extension, direct attack still may not work. You have to attack with constructive purpose in mind, rather than for the sheer joy of making your opponent respond. and are counter to good go sense because they are attacking from your strength, rather than attacking from your weakness and pushing your opponent up against your strength. Each of these black plays don't help the already impervious black group on the left, but they all strengthen white, which weakens to the point where this stone is lost. You could try the peep at , which white should resist with rather than connecting with a. Then jumping to attacks the white stones on both sides. Hoping someone can say why white playing is a bad move please. My immediate thought is , or tenuki. 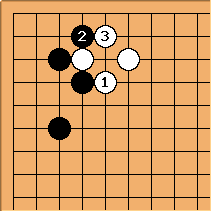 Here black has secured a big corner and white is heavy and/or overconcentrated. White played 3 moves to give black a solid corner, but has little aji in exchange and no base or outside thickness. also doesn't have much effect on black. 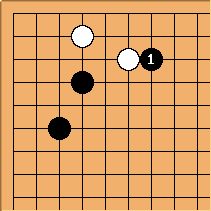 If black has a stone on the top side as well, white is immediately forced to run without getting any benefit in return.